What is the element Krypton as on the Periodic Table? A whitish, largely inert gaseous element used chiefly in gas discharge lamps and fluorescent lamps. Solid krypton is a white crystalline substance with a face-centered cubic structure which is common to all the 'rare gases'. The Atomic Number of this element is 36 and the Element Symbol is Kr. The name originates from the Greek word 'kryptos' meaning hidden. Elements can be classified based on their physical states (States of Matter) e.g. gas, solid or liquid. This element is a gas. Krypton is classified as an element in the 'Noble Gases' section which can be located in group 18 of the Periodic Table. The term 'Noble gas' derives from the Old High German word Edelgas from 'edili' meaning "noble". The name 'noble gases' is an allusion to the old, similarly termed 'Noble Metals'. The Noble Metals included gold, silver and platinum which were so called due to their long association with the aristocracy. Krypton was discovered by William Ramsay and Morris Travers in 1898. 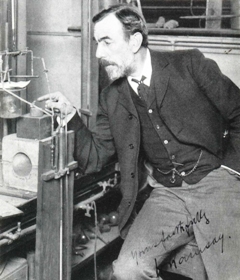 Sir William Ramsay discovered the noble gases and received the Nobel Prize in Chemistry in 1904 "in recognition of his services in the discovery of the inert gaseous elements in air". These elements included Argon, neon and Xenon. Ramsay also isolated Helium which had been observed in the spectrum of the sun but had not been found on earth. In 1910 Ramsay also made and characterized radon. Check out Krypton on the Periodic Table which arranges each chemical element according to its atomic number, as based on the Periodic Law, so that chemical elements with similar properties are in the same column. Our Periodic Table is simple to use - just click on the symbol for Krypton as on the Periodic Table for additional information and for an instant comparison of the Atomic Weight, Melting Point, Boiling Point and Mass - G/cc with any other element. An invaluable source of facts and information as a Chemistry reference guide. The Standardised Periodic Table in use today was agreed by the International Union of Pure Applied Chemistry, IUPAC, in 1985 and now recognises more periods and elements than Dimitri Mendeleev knew in his day in his day but still all fitting into his concept of the "Periodic Table" in which Krypton is just one element that can be found. These articles contain facts and information relating to Krypton and each of the other elements including the Periodic Symbol, group, classification, properties and atomic number which is often referred to as the Periodic Table Number. Test your knowledge of chemistry and the Periodic Table by completing the Element Symbols and Atomic Numbers on our Blank Periodic Table. Chemistry students will also find a helpful section on Chemical Formulas.